Well, if you haven’t heard by now that Tim Drake died, I’ve already spoiled it for you. But I had no choice. 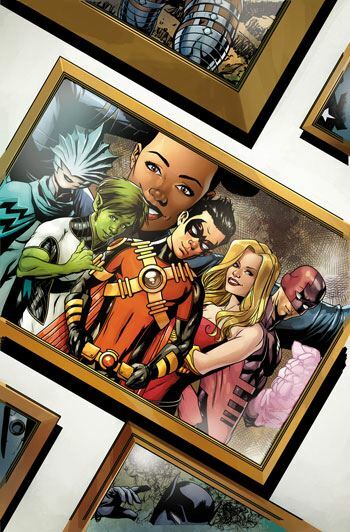 Teen Titans 24 is devoted to a memorial for the newly dead Robin, in which Bedard has all the members of the Titans discuss their memories of Tim. It’s the kind of story that is somewhat mandatory, and usually far too saccharine. Bedard handles it very well, though, expanding the personalities of the various Titans members, who have not really had a lot of development during the New 52 period. And credit also goes to Churchill and Rapmund for the art. I love their rendition of Beast Boy, and it very much suits the odd bit of information about him that we get in this issue, that he snacks on fish food. Bunker, who is pretty much my favourite from this line-up, opens the story with one of the longer memorials, a really entertaining story that includes the gay hero finding something for the straight boy to wear, and a march through Pride. Power Girl, Raven and Wonder Girl each share memories that flesh out both Tim’s character, and their own. Considering the series is coming to an end, about to be Rebirth-ed, it’s with mixed feelings that I note how very interesting the members of the team have become. The conclusion is inevitable, given the cancellation of the series. But there is a nice tease as to what is to come.